VALDOSTA — Valdosta State University invites all faculty, staff, students, alumni, retirees, and friends to join the Holiday Helper Tree Project and help make the season bright for a child in need. 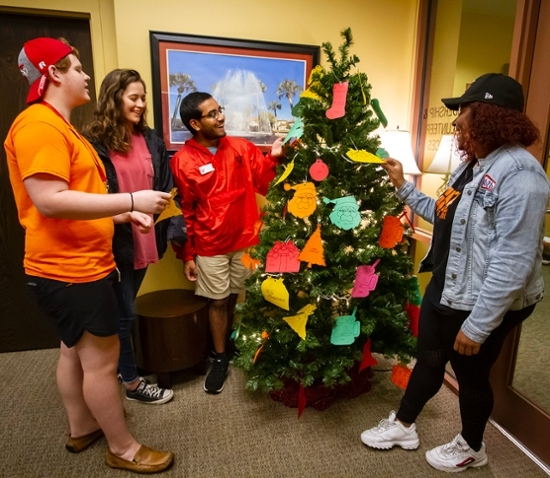 An annual Blazer Nation tradition, the Holiday Helper Tree is housed inside the Office of Student Leadership and Volunteer Services, on the third floor of the Student Union. It is decorated with handmade ornaments featuring the Christmas wish and needs lists of more than 60 community children who need an extra dose of holiday cheer. Participating in the Holiday Helper Tree Project is a fairly simple three-step process. 1 — Choose an ornament from the tree. 2 — Get in the holiday spirit and go shopping for the items on the child’s wish/needs list. 3 — Return the unwrapped gifts and the ornament to the Office of Student Leadership and Volunteer Services by 5:30 p.m. on Wednesday, Dec. 12.